We have a new Spider-Man: Far from Home international trailer for everyone to check out. Sony and Marvel Studios finally released the first trailer for the upcoming sequel this morning, which brought with it a ton of big reveals, thrilling footage and puzzle pieces we can't quite put together yet, since this movie will take place after the events of this summer's Avengers: Endgame. While this trailer largely mirrors the one that was released earlier, it does bring with it some very entertaining new footage. The key difference with this version of the trailer form the first Far From Home trailer is the opening sequence. This one kicks off with Peter Parker rolling through the airport on his way to Europe with his pals. As we see, aunt May managed to sneak is Spider-Man costume into his bag without his knowledge, which catches the eye of airport security. In the regular trailer, Peter tries to explain to May that Europe doesn't need a friendly neighborhood Spider-Man and that he just wants to try and enjoy his vacation. So much for that. 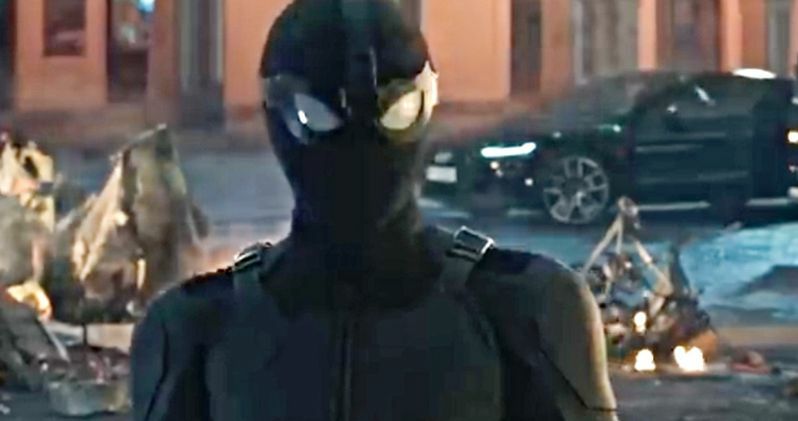 As we seen in the rest of the trailer, Nick Fury winds up recruiting Peter Parker for a mission during his stay in Europe, as there are some mysterious beings causing destruction. We've also got Peter Parker flirting heavily with "M.J." (who isn't Mary Jane Watson), and a whole lot of action. This all leads to the ever-important and highly-anticipated reveal of Jake Gyllenhaal as Mysterio, who looks incredibly faithful to the version of the character, fishbowl helmet and all, that we're familiar with from the comics. Though, in this situation, he's being painted as something of a hero, as opposed to a villain. There's also the great bit at the end with Flash saying that Mysterio is "no Spider-Man" while making fun of Peter Parker, who happens to be in the same room. It remains to be seen how Avengers: Endgame will tee up the events of this movie, which is a nagging issue for many Marvel fans. Setting that aside for a moment, this looks like it's going to be massive in scope and unlike any previous Spider-Man movie to date. The cast includes Zendaya, Jacob Batalon, Tony Revolori, Martin Starr, Numan Acar, J.B. Smoove, Oli Hill, Remy Hii, Marisa Tomei, Michael Keaton, Jon Favreau, Cobie Smulders, Samuel L. Jackson and Tom Holland back as Peter Parker/Spider-Man. Jon Watts returns to direct after helming Spider-Man: Homecoming, which was received generally very well by both fans and critics, and grossed $880 million worldwide. This movie has the very tough burden of being the first MCU entry to arrive following Avengers: Endgame. But based on this first trailer, it appears as though Spidey is going to be up to the task. Spider-Man: Far From Home is set to arrive in theaters on July 5. Be sure to check out the new international trailer from the Sony Pictures Releasing UK YouTube channel below.